James Charles was one of the two recipients of the Utah Arts & Museum’s annual Visual Art Fellowships this year. He won for a new body of work, completed after a debilitating neck injury left him unable to paint for a two-year period. The works are minimal, restrained touches of color on white surfaces, and scaffolded on strict grid, multiple squares floating on top of and embedded into the paintings’ surface. Recently Charles has expanded this aesthetic to three-dimensional works, carrying to these pieces reiterated motifs like the rose. 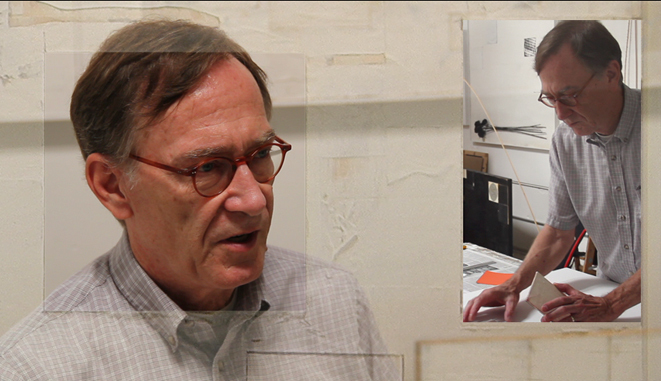 Our video profile shows Charles at work in his studio, sizing up compositions and carving out panels, as well as discussing his life, the ideas behind his works and the power of symbols. I don’t know which I like better. 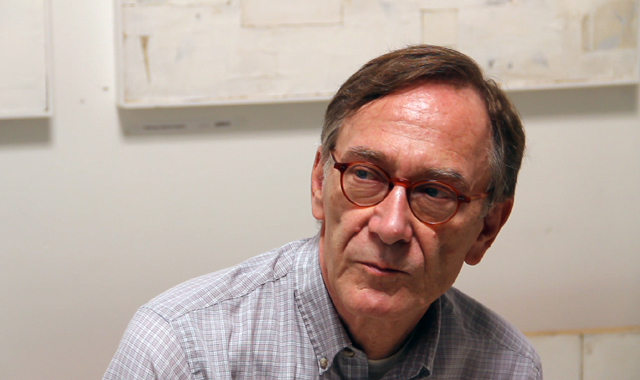 On the one hand, Rossiter’s decision to mimic Charles’ use of inset squares by dividing his video frame into small, active inserts calls attention to one of the artist’s accomplishments, which is to break out of the Florentine assumption that a painting is a window into another, imaginary space. Charles chooses to emphasize the flatness of his work, which has the paradoxical effect of emphasizing the rough textures and contrasts of his panels. The pleasure of their various textures nicely replaces the allure of imaginary depth. On the other hand, showing us the artist’s studio allows us to see not just where his work comes from physically, but where it comes from aesthetically. The neat, organized, almost spartan workspace where he works returns in the clear, unified, sparse-yet-plangent space that is the painting. Between these two qualities so well transmitted here, I find myself eager to make it to the Poor Yorick open house. Only a fool would think he can evaluate art accurately from a tiny copy, but this one makes me want to see James Charles’ paintings in person, for myself.